We love Frida Kahlo here at the Montana Art Project, not just because of her inspiring emotional art but because of her strong feminist story. Boys also love painting Frida in this expressive ‘street art’ style using a mixture or acrylic and spray paints with stencils. This style of art is accessible to a large range of ages and comes down to the individual child’s ability to concentrate on a fun activity over a 2 hour period. The most challenging aspect is the use of spray paint; we supply gloves and safety glasses. If your child can’t master the cans, it may be up to you, the parent, to finish the project for them. Children 10 or older ought to be fine. It is fun for both the parent and the child to paint, however if you want to share a canvas that is fine too. Do your own painting, then book for each person: sharing a painting, then book for one person. This is a perfect chance to try something new so gather your creative tribe and head on over. Frida is an icon made famous by her paintings and life of “pain and passion” and for her intense, vibrant colors. 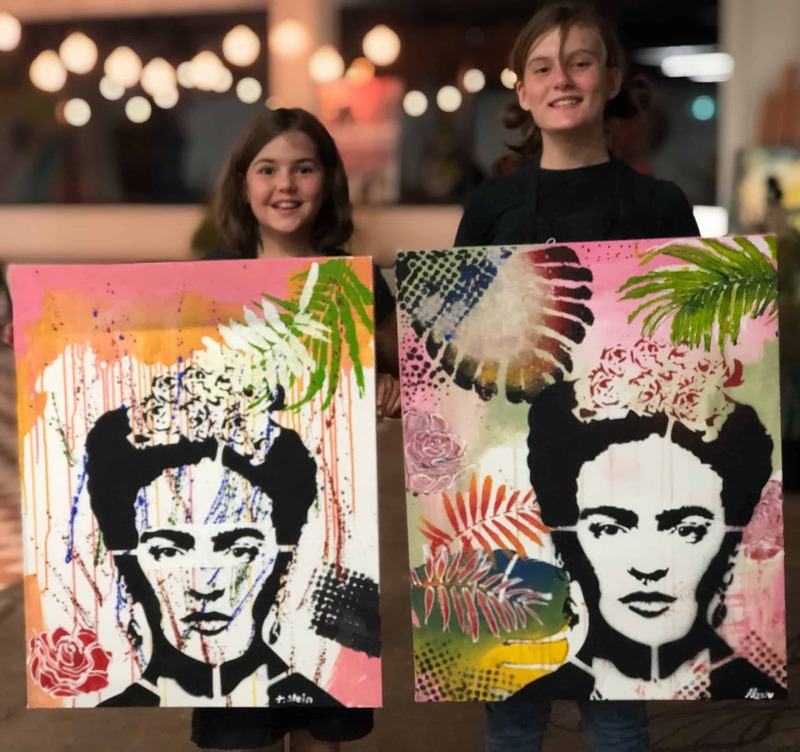 We capture the Frida spirit using great colours and fun to use stencils. Please arrive a little early for a 10.00am start. We are located above the Montague Hotel at 363 Montague Road, West End. Classes end between 12.30 – 1.00pm. For our school holiday classes you can bring your own nibbles.